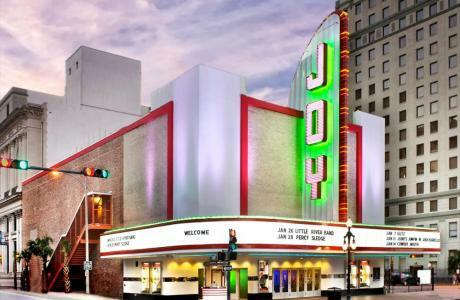 Staying true to our New Orleans heritage, the Joy Theater has been returned to its art deco grandeur of the late 1940′s, including the renovation of the iconic marquee that graces Canal Street once again. This restored landmark theater can be the site of your next private or corporate function including receptions, cocktail parties, meetings, awards ceremonies, dinners and concerts. 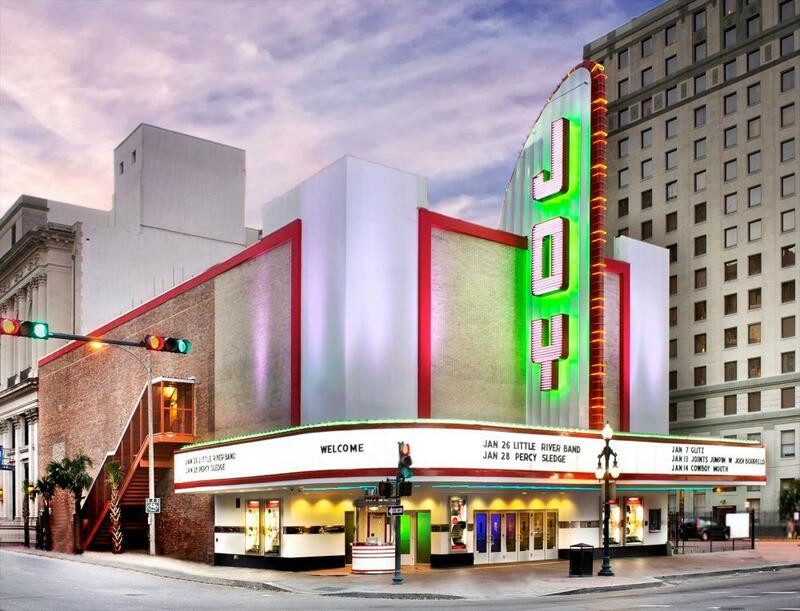 The Joy Theater features a state-of-the-art sound and lighting system, a built-in stage and flexible seating plans that can be configured in almost limitless ways to support your New Orleans event. The Joy Theater boasts a state of the art sound, lighting, and video system like no other in the City. The use of all audio and lighting equipment with video screens is included in the rental fee. Staffing fees apply for our in house technical team. Please visit our website for complete production information and system specs. •	d&b audiotechnik V-Series line arrays with b22 subs •	Avid Venue consoles at both the contact front of house and monitor positions •	Live audio and video recording capabilities in house •	HD displays: 2 55" LCD displays over the bars; 1 70" LCD display in the lobby - can be programmed with your message through SCALA •	On stage: three giant HD motorized screens with Digital Projection Titan HD 3D capable projectors (1 center screen 27' diagonal and 2 side screens 13.41' diagonal) •	Two PTZ HD cameras and one mobile camera available •	All are mixed and routed from a video mix position and most any video source can be utilized with this system to accommodate any function •	House lighting package features a full array of both static, color changing, and intelligent, moving fixtures. Custom configurations are available to suit your specific event. The Joy Theater retains all rights to provide food and beverage service. We work with preferred caterers that highlight New Orleans cuisine - from casual to upscale, including vegan, organic and gluten-free. Outside catering allowed with facility fee. Theater	 Seating for up to 656 people and standing roomup to 1200. Preferred caterers that highlight New Orleans cuisine - from casula to upscale, including vegan organic and gluten-free. Production The Joy boasts state of the art sound, lighting and video system like no other in the City. The use of all audio and lighting equipment with video screens is included in the rental fee. Sound The professional surround sound system features JBL Vertec Line Arrays and a 12 mix powered monitor mix. Avid Venue consoles at bothe the contact front of house and monitor positions. Live audio and video recording capabailities in house. Video Displays can be programmed with your message. Almost any video source can be utilized with this system to accommodate any function. Lighting The house system was specifically designed to fulfill most band riders and private event needs, custom configurations are available to suit your specific event.